Carol Ann Duffy spoke for around an hour, captivating every single person as she read out her amazing poems; some from the point of view of the wife of a famous man, mythical or real. One of these examples is Mrs. Midas, who is left to deal with the atrocious consequences of her husband’s whimsical wish. 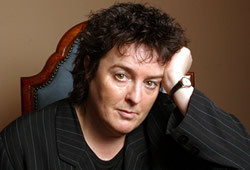 Carol Ann Duffy made us laugh and cry; she told a few poems about her mother, which was very emotional. The thing that I most enjoyed about her appearance was her anecdote about one of her poems, a more serious one written about the dangerousness of knives, especially with children. This poem was removed from the GSCE paper, and Duffy later wrote a poem about said person, bringing us to tears of laughter yet again. I really enjoyed Carol Ann Duffy’s piece, especially since I am not really into poetry; she can create such beautiful poetry that even people who hate it cannot help but listen to it and still be awestruck. Carol Ann was supported by a band called LiTTLe MaCHiNe, who are truly amazing. They combined genuine and heartfelt poetry with the incredible wonder of music. They made me rethink many poems that I had imagined in a completely different light. One of these amazing phenomena was a rock & roll beat composed to Fear No More by Shakespeare. I had always imagined Shakespeare’s poems and plays to be soothing and gentle, but LiTTLe MaCHiNe gave Shakespeare a whole different side to his personality. This was the same with Lewis Carroll’s Jabberwocky. The way the band completely changes the view of these amazing poets brings a new and amazing aspect to poetry. Overall I really enjoyed the performance, as it made me completely rethink the idea of poetry and I came away from the Dome with an entirely new opinion of poetry. Posted in Press and tagged brighton dome, Brighton festival, carol ann duffy, new writing south, poetry sussex, poetry to music, sussex arts by Walter Wray.